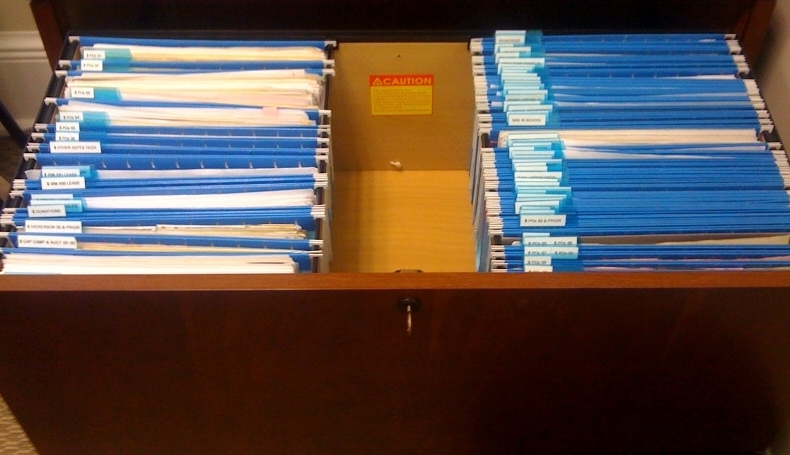 For my second post on my adventures with GTD, I’m talking about filing. Prior to reading Getting Things Done, my file cabinet was very tidy, but not really easy to navigate. Each draw held a category of file and trying to keep the pop-in tabs of my hanging files staggered was impossible. David Allen recommends a simpler method that includes straight alphabetization and skipping the staggered tabbing. I won’t give away too much from the book, but these are some of my files now. Not only can I find everything, but I can tell someone else exactly where to find a specific file – what drawer, what the label it is under and in some cases whether it is in the front or back of the folder. This came in handy during my recovery from surgery recently when members of my team needed essential files immediately. This paper management system has been extremely helpful. Beyond that, I’ve stared down the road of digitization when my school got new copiers with high-speed scanning to PDF. Many essential files are now scanned to PDF and stored electronically. Tomorrow, I’ll share how I started GTD with a paper system for about $5. After that, I’ll share how that system has morphed into an electronic system that incorporates Outlook and my iPhone.